February 20th, 2018 San Jose – Costa Rica.- Bitcoin has/is hitting the mainstream, and Superior Casino and 24VIP Casino are pleased to announce that bitcoin is supported and accepted as a payment method. Superior Casino pioneered the use of Bitcoin for the online gambling industry in 2014, revolutionizing the simplicity and security of online transactions. The team behind Superior and 24VIP Casinos launched its operation in 2006. These casinos are powered by Rival Gaming software offering a full suite of slot games, bonus rounds slots, and all of the exciting casino tables. These games are recognized as being at the cutting edge of Igaming innovation – especially with the mobile suite of games. In addition to Rival game options, 24VIP and Superior Casino offers a full suite of 3D quality games developed by Betsoft. Additionally, for players who prefer to play with a live dealer, the casino offers a Live Gaming Lobby powered by Vivo Live Gaming. Both casinos offer players from all markets the ability to play in their local currency such as US Dollars, Australian Dollars, Euros, GBP and South African Rand. 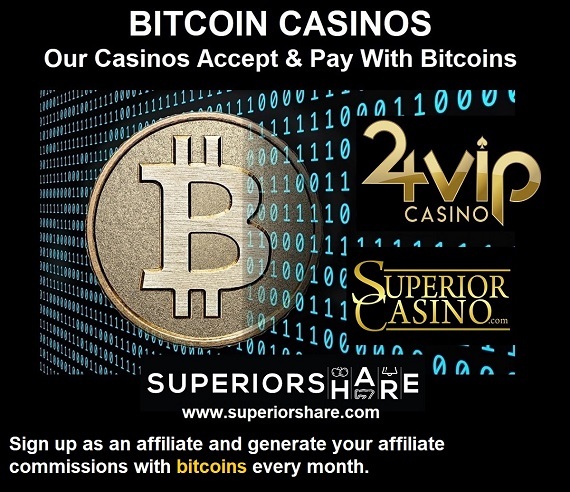 Superior and 24VIP Casino are also offering special incentives to players that use Bitcoin. They can fund their casino account with bitcoins and receive a 275% welcome bonus as a new player, and 100% deposit matching on all future transactions as a returning player. “Since 2014 we’ve been supporting bitcoin player transactions either to purchase or withdraw winnings. I am glad to see that this fast method of payment is now the future of online casino transactions” said Roger Salton, our casino manager. The use of Bitcoin presents a unique partnership opportunity for websites promoting this type of transaction. Advertising that these casinos support Bitcoin can help generate revenue based on the activity of the players. We invite cryptocurrency portals to promote our brands via our affiliate program SuperiorShare. As an affiliate, the Commission payments can be paid with Bitcoins or other methods of payment. SuperiorShare has been operating since 2006, created by former affiliates to provide online casino webmasters the opportunity to earn substantial revenue promoting the finest casinos online. Our affiliate program offers up to 45% commissions on the life-time of a player, monthly payments via bitcoins, access to real-time statistics and assistance of a personal affiliate manager. Sign up for an account at SuperiorShare.com and be part of our Superior Team of affiliates.